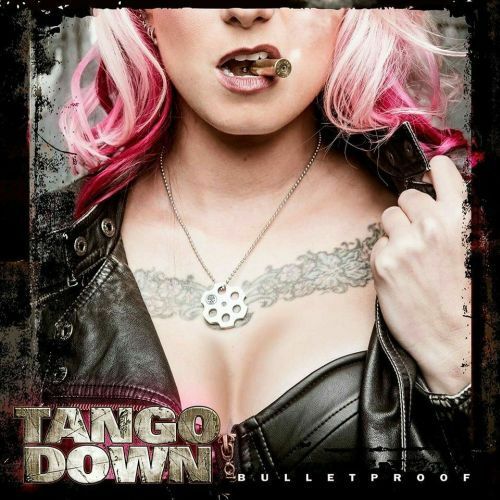 Melodic Hard Rockers Tango Down are back with their fifth studio cut in “Bulletproof”. This time around some changes have taken place to the core of the band’s line up. Gone is super vocalist David Reece, who’s very well known in the Rock world, and to my surprise his exit, gives way to another excellent front man in the one and only Chas West former (Bonham, Lynch Mob, Foreigner). A guy who brings a soulful approach and strong core to his vocal approach. Good choice. Also to some who recall Chas took over Jake E Lee’s Red Dragon Cartel after their vocalist changes, and he did a great job. The new album kick starts things nicely with a thumper of opening cut “Punching Bag”, attitude and tight riffs welcome the band back here, this little tune has a little of Thin Lizzy meets a modern Hard Rock edge full frontal, straight up with no excuses, good strong track to open things up. Next top song hitting my taste buds just right, is the title song “Bulletproof”, an edgy riff provides the listener with a harder approach, but yet melodic so is clear you get what this band is really made of. Nice lyrics provided by the versatile Jason (Jace) Pawlak, a solid backbone to the Kivel Records family. With “Carry On”, I hear a bit of Billy Idol in it’s core, another twisted play with lyrics and the solid backbone of Scott Miller’s guitars, add a nice touch. One of my favorites cut gets delivered via “When We We’re Young”, with a nice youthful retrospect as the root of the song, another nice chorus and bridge provide a strong lead to a great job on vox by Mr West, one of the top tunes on this one for sure. Quickfire lyrical delivery pick things up on the frenetic rhythm of “Superstar”, that only provides a crucial handshake to my favorite tune here in “Edge of Goodbye’, the chorus and bridge here are fantastic, the guitars and rhythm are sound and aspiring. This song resonates the easiest and leaves a rocking vibe long after you hear it, job well done. Before you know it, the total of 10 tracks are over and you really want to dig in and listen to it all over again. Klasse Album mit einer richtig guten Mischung aus Whitesnake-esken Rockern und melodischen AOR Nummern, Psy und Joey hören bitte rein!